- Trish Marcine: 23, 5' 5", 165 lb, 156 cm snowboard, 11 years riding. This is the best board i have ever ridden in my life. I am so glad i laid out the cash for it. It handles well at all speeds, it's extremely light, and from my experiences it wasn't bad in the powder at all contrary to what others have mentioned. I would reccomend this board for beginners and advanced boarders like myself, with no hesitation. It out-rides the Ride vista anyday, which is another board i have, but the feel good doesnt wobble around at higher speeds like the vista. Definitely a perfect 10. - Katie French: 21, 5' 8", 155 lb, 156 cm snowboard, 3 years riding. This board, for the most part, is really amazing. It really is what Burton said it would be. It has a really nice and lively flex, which was something that I was realy looking for in a board. Another great aspect are the edges, they dig beautifuly into ice or powder. One feature I'm not too pleased with however is the quality of the decorative top sheet. After my first ride with it, it was all chipped and scrached - and I had been very easy on it. Another negative feature is that the topsheet designs are kind of hoaky and busy. 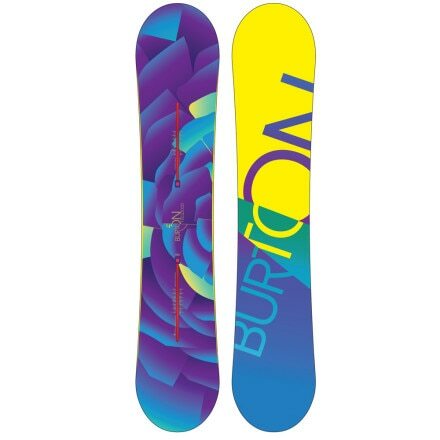 I think Burton went overboard with it when they tried to make a board just for girls. - Claire Frost: 22, 5' 7", 130 lb, 152 cm snowboard, 5 years riding. This board rocks! K I did come to it having riden a guys board (nitro gothic 152) for 4 years but the improvement really was incredible. Holds an edge really well - wont slip out over ice. Very snappy edge to edge, real sense of power coming out of turns. Very fast! Low swing weight so initiating spins a doddle. Solid on landings. Very stable on rails. Really good in pipe as holds an edge so well. Feels solid at speed. Flexible enough for some board manipulation eg nose presses. I dont tend to really huck an ollie but it rewarded the effort with superb pop! Weaknesses - ummmmm, looks so nice i have to take a little extra care not to hurt it! The best female specific board out there? Definately worth the money. - Palegreen Sarah: 30, 5' 7", 140 lb, 152 cm snowboard, 5 years riding. okay, i've tried out the feelgood for the last 3 years and not much improvement except can i say that the graphics are CHEESE. it looks too much like a woman's board. why can't they design a board that looks as cool as burton's lexa?the best thing about the '03 feelgood is that the laminate is more durable than last year's and doesn't retain the snow as much. other than that, this is a snappy and lively board that is easy to use and for just about anybody. - Joy: 22, 5' 9", 155 lb, 152 cm snowboard, 4 years riding. This board is perfectly designed, especcially for woman riders. It is quick and sleek. The waist is thin and is good for woman's balance and smaller feet. I am so glad i bought this board. It gives me much better performance than any other board has(burton or otherwise). This board has moderate flex. The core is thick and awesome for carving and holding the carves. It is good on both powder and packed surfaces. The feelgood is not special for terrain parks and it is not amazingly lightweight, but I have definately gotten great air with this board and it is easy to land jumps with. Burton makes most of their boards to handle the pipe well and their woman's boards are no exception. I would recommend the feelgood to most any female, from average to expert. I get compliments on this board all the time, and I'll make one last point to mention that the graphics rock. - Dirty Tomato: 33, 5' 4", 110 lb, 148 cm snowboard, 3 years riding. Good on packed powder and ice. Very responsive with regard to turns. Good flex for half-pipes and jumps. Overall nice board for women. Very cool graphics to boot! The only con would be that they could make the board a bit lighter. - Michelle Szajko: 24, 5' 3", 130 lb, 144 cm snowboard, 8 years riding. I love this board! It’s the perfect length for us short gals. It looks great too. The reason I didn’t give it a higher rating is because it’s not as flexible as I wish it were. It’s great for down hill, but as far as freestyle, I would say that it needs to be more flexible. You can bend it just fine, but if you like to do manuals, I would recommend another board. I still use this board to this day; it is one of my favorites. It is truly great for someone who is just starting to learn freestyle and vert. - Lauren Lowther: 33, 5' 1", 112 lb, 144 cm snowboard, 6 years riding. This board has long been a female favorite, as it has great flex for the park, and terrific response, but can really hold its own while carving the groomed runs. The board is light as a feather, but, then again, it's only a 144. If you like to ride fast and not fall, and if you like to hit the terrain park, this board accomplishes both very well. However, if you hit the deep stuff, it is difficult to stay afloat. This might not be the case with this board in longer lengths, but the Feelgood 144 is not ideal for powder days and flat mountains- I can't tell you on how many cat tracks and flat parts I have had to unstrap while the guys on their 161s went flying by me. My best purchase this year, hands down! So after riding my K2 for a few years I decided I deserved an upgrade. Like most females my original attraction to the Burton Feelgood began with a glance. Its graphics pop off the board, it has tons of color and it’s just sick! I would say...Love at first sight! This board is light weight, has great pop, rides smooth and cuts sharp. I could feel an increase in my control and its super forgiving. I love to ride it in the park, especially b/c it’s super light. Matched up with the Burton Triad my combo is awesome, looks great and feels amazing! This is a great all around snowboard. It really grips on the steep slopes. It carves nicely on the morning groomers. And it's quick and responsive on the bumps and in the trees. I was riding a five year old feelgood before purchasing the new feel good. This board seems a little stiffer that what I was used to but I had no problem with the changeover. i totally love this board, I rode it for the first time the other day and it was awesome. it was super stable and had tons of speed. it grips the hill really well in less then prefect conditions and does great in powdery glades. it's also really light and easy to maneuver, plus it's so pretty :) it feels great and i feel really confident on this board. This is an amazing board, I love it. It handles great in all conditions; fresh powder, chewed up ice, and heavy spring conditions. It takes little effort to control it. I've been riding it with Burton Lexa bindings, they make a great pair. This has been my first year on a snowboard and I've been able to progress a lot on this board. I would recommend it to riders of all levels. For years I've never gotten past intermediate with my nine-year-old Feelgood. Just bought this one and it is amazing. Advanced technology does make a difference. So much easier to carve. Very responsive. I should have done this years ago... I've improved in two weeks more than I have in 8 years. The Burton Feelgood makes you a better snowboarder the moment you strap it on. I took lessons and continued to fall all over the place on my old (non Burton) board during my first year of boarding. I am coordinated and athletic and was very disappointed at how hard snowboarding seemed to me at the time. I purchased my '08 Feelgood based on reviews here, and it did not disappoint. Once I started on this board, I went from clumsy novice to intermediate right away. I know high quality gear can make a big difference, but this was a huge leap in skills for me solely due to the board. My husband and friends were impressed! It's held up quite well, although I find Burton boards overall to crack somewhat easily on the top. I am 5'8" and a sturdy 160 and I went with the 158cm, which is shorter than the recommendations in the sizing chart. If I had to do it over again I would go even shorter - a 156cm. Compared to a 156cm I recently purchased (different make and model), comparatively the 158 feels a bit long now and takes more effort to get into the turn. I use the board mostly for all mountain riding at on primarily intermediate runs. this board rides so well. it is responsive without being touchy, and i have seen drastic improvement in my ability to both ride all-mountain with increased speed and manuverability as well as stick jumps and try new tricks in the terrain park. i love this board. i think you might, too. A lot of our testers felt that this board was a bit stiffer than what they’d usually want to ride, especially on rails and other small park features. The stiffer flex pattern was the most fun in the halfpipe and on agressive freeride terrain. Despite what Burton says, we didn’t feel that this board would “perform no matter what your skills or style.” It would be best suited for a solid intermediate to advanced rider most interested in riding pipe and steeps. The EST system got mixed reviews. Everyone appreciated the wide variety of stance options that this offered, but while some testers liked that they could really feel the snow texture, others felt that they could feel too much vibration, especially at higher speeds or in choppy terrain. I have this board, and I LOVE it! I use it mostly for riding powder and in the backcountry. It is rocking because it responds so quickly (since it is extremely stiff) and it is really light and all around my most favorite board that I have ever had. As for the pop, you just have to have the weight and the strength to flex it and then you get some decent pop out of it. Just thought I would put in another opinion, since you rated boards mostly on how they perform in the park, and not everyone rides in the icy park! I had this board and found it unbelievably stiff. I ride park and as for jibbing its not that fun and doesnt have the good pop for jumps. I think that this board is good for learning as it does respond quickly when freeriding but i believe that a rider quickly progresses past this board. But in a pipe this board is super super fun. i LOVE my new feelgood...molly and kelly did a great job with this one. took it out to the mountain for the first snow and it performed like a charm. be sure to wax and detune before you head out to the mountain. This board is awesome. I first demoed this board and loved the feeling of it so i bought it. I use the board as an all mountain board and it is great! I wouldn't change a thing about this board. As a beginner I Rode this board as a demo and loved it, The edges didn't catch at all and felt like I could just glide down the mountain. It seemed to go really good at higher speeds as well. In all, an awesome board that i considered buying, the only thing that stopped me was that i prefer a rocker as i think they feel a lot smoother than regular camber -but that's just my personal preference.